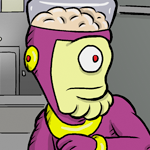 History: Big Brain comes from a planet of highly intelligent creatures, but he always had his eye on being something more. He came to Victory City at a young age to attend the Victory City Community College, where he majored in Exo-Suits and minored in Hypothetical Energy Sources. After graduation, BB jumped around to various jobs, including a stint in the union’s R&D Department. Big Brain is currently serving as a reservist until he can get a full-time spot on a team.